Find the length along the shortest path passing through certain points on the cube. A large cube made from 125 smaller cubes, 5 by 5 by 5, is 'perforated' by removing cubes. 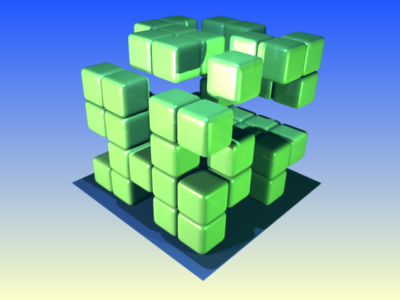 Any cube may be removed so imagine some uncoloured, transparent cubes propping up anything that needs it. If a 'perforated cube' has the three views (projections) below, what is the most and the least cubes possible to make a shape that has these three projections ? In other words what could be the most and the least cubes left from the original 125 ? Real world. Cubes & cuboids. Maths Supporting SET. Chemistry. Working systematically. Visualising. Games. 2D representations of 3D shapes. Mathematical reasoning & proof. PrimaryGames-Strategy.